(UNION CITY) Mayor Brian P. Stack and the Union City Board of Commissioners announce the collection of donations for the victims of Saturday’s earthquake in Ecuador. 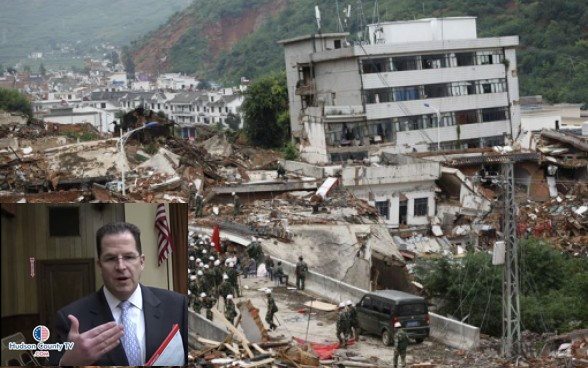 “My heartfelt sympathies go out to those families affected by Saturday’s earthquake,” said Mayor Brian P. Stack. “We will try to assist in any way we can.” Mayor Stack announced that the Union City Parking Authority would house a trailer to be used to collect canned goods. “In the aftermath of such a disaster, people are attempting to contact family members to ensure their safety,” said Commissioner Maryury Martinetti. “The City is trying to assist families here, in Union City, during this difficult time.” Families may call a helpline at 1844-668-4543 if they are trying to locate family members in Ecuador. Pennsylvania Avenue & 15th Street NW, Washington D.C.